← 2011-07-03 Michael McFadden: If “Smokers need not apply” then why not motorists too? 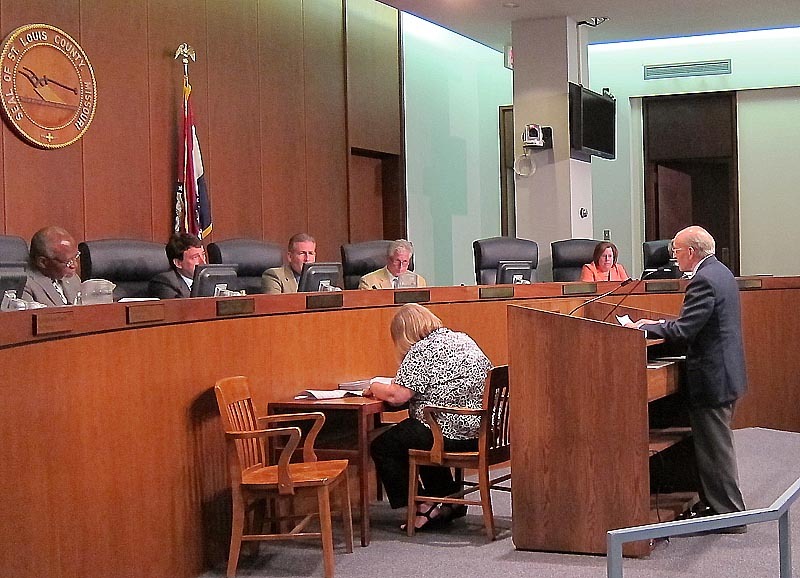 During the public portion of St. Louis County Council’s regularly scheduled evening meeting at the County Government Center in Clayton on Tuesday, July 27, 2011, a number of people spoke in favor of comprehensive smoke-free air legislation. Some prominent supporters of smoke-free air were present but did not speak. They included Pat Lindsey, Executive Director of Tobacco Free St. Louis, shown here outside the council chamber after the public portion ended. 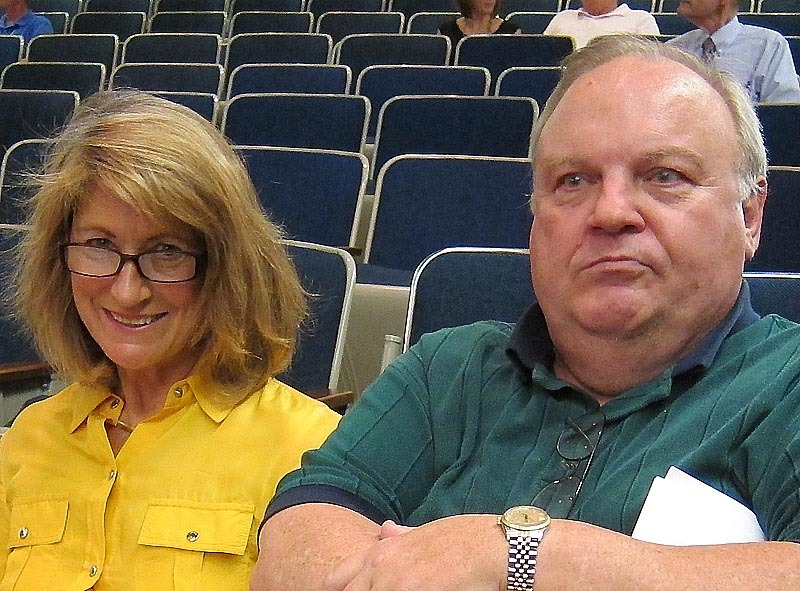 Charles Gatton is shown below sitting with Barbara Fraser in the council chamber before the start of the meeting. Barbara Fraser, former St. Louis County Council member who stepped down from the council to run for a Missouri Senate seat which she lost by a very narrow margin in 2010, was first to address the council. She made impassioned and forceful arguments in favor of removing the exemption for small bars which had been included in her original legislation. (Another major concession to get the votes she needed for passage of her ordinance was an exemption for casino gaming floors.) Her testimony is reproduced below. I followed Ms. Fraser, presenting information relating to the recently-published peer-reviewed paper on casino revenues and smoking of which I was last of the six coauthors. A full version of my testimony, which was shortened when read to the county council, follows at the end of this blog after St. Louis Post-Dispatch reporter, Paul Hampel’s, story below. Testimony was also provided by two bar owners, one of whom, Marty Ginsburg, has been a highly vocal opponent of smoke-free air legislation for many years in the past, but who is now supporting removal of the loopholes which he views as hurting his business. 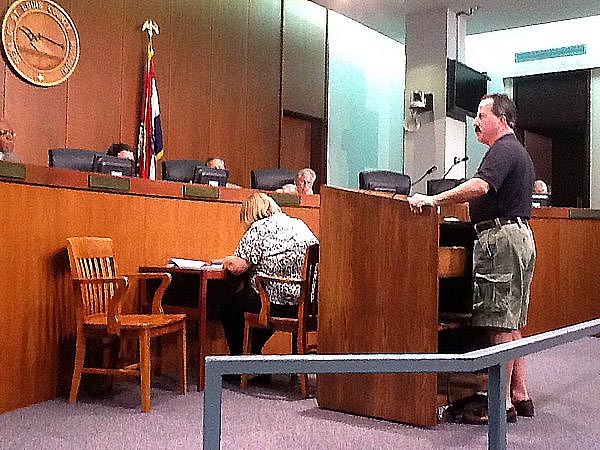 Marty Ginsburg of the Sports Page Bar and Grill speaks before the St. Louis County Council. Ginsburg wanted council members to remove exemptions for small bars. 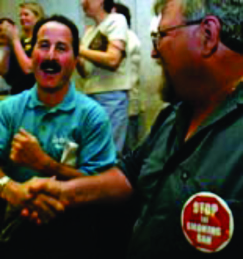 And below is a St. Louis Post-Dispatch photo from August 2005 of Marty Ginsburg celebrating the defeat of the effort by St. Louis County Council to pass a comprehensive smoke-free air bill on the night Harrah’s Casino bussed in hundreds of employees to pack the council chamber in opposition. Here is the text of Barbara Fraser’s presentation to the county council. With the background of a St. Louis County Council member, a state representative and currently chair of the Tobacco Free St. Louis (TFSL) Coalition board, I address you tonight well qualified to speak on this issue – but I speak to you as a citizen in this county who knows the benefits of clean smoke free air. Though the Clean Indoor Air Act has been successfully implemented throughout the county – and thousands of places of work are now smoke free – it is now time to eliminate the exemptions for those so-called “Small bars.” As you know, the bill – the clean air act – that passed was a compromise bill after the defeat of more comprehensive legislation. I implore you to remove the exemptions for small bars. This would be a simple bill; simply removing the section 605.060 Part i. Three reasons: Because second hand smoke causes cancer, heart disease, and serious lung ailments. 1. Second hand smoke is a serious health risk. I ask you as decision makers to make a difference in the health of your constituents. Food service workers have a 50% greater chance of dying from lung cancer than the general population. The toxins in second hand smoke cause respiratory problems such as wheezing, coughing asthma, throat and even eye and vision problems. Anecdotally, I am amazed at the numbers of musicians (in addition to 100’s of service personnel) who consistently tell me how much safer/healthier the smoke free environment is for their bands. 2. Evidence shows that an overwhelming 72% of the county voters support a smoke free law that includes the now exempt bars. – St Louis County has contracted with Washington U and St Louis U and others to implement much of this grant – (TFSL Coalition does not get any of that funding) – BUT this item is solely the responsibility of the government policy makers – OUR Health Dept. has received this money and now it is time to act on this promise. YOU, the policy makers, Mr. Dooley and the Health Dept. need to remove these exemptions. – Knowing how the council works, I reiterate my request: Mr. Dooley and Dr Gunn, your sincere endorsement of this measure, along with the council’s support, will successfully eradicate the exemption. Following is the article by St. Louis Post-Dispatch reporter, Paul Hampel, who focused on Barbara Fraser’s testimony and that of the bar owners. A former member of the St. Louis County Council and several restaurant owners appealed to the council Tuesday night to revoke exemptions from the smoking ban that have been granted to 153 establishments. Former council member Barbara Fraser, of University City, cited a recent American Cancer Society study that showed 72 percent of county residents would favor a law that prohibits smoking in all indoor public places. 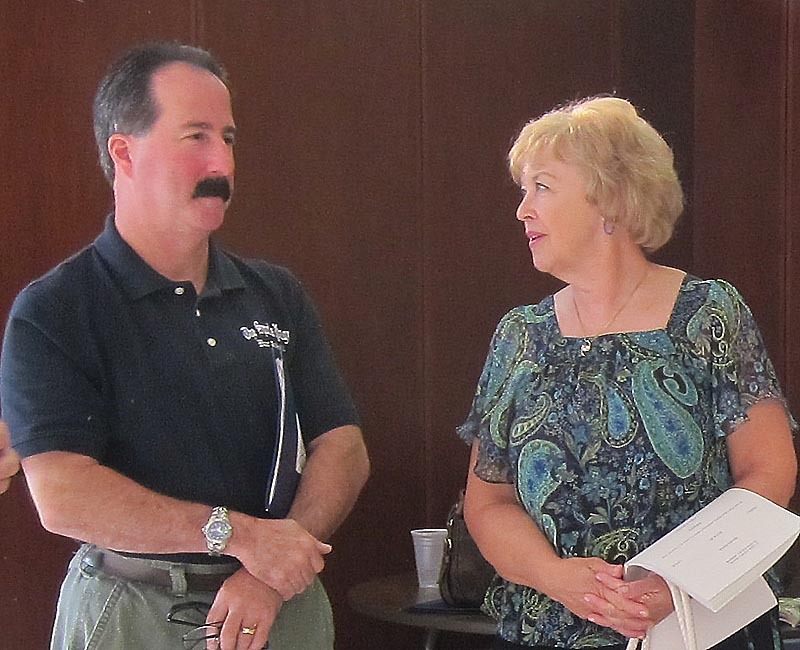 Fraser is now chairwoman of the anti-smoking group Tobacco Free St. Louis. County establishments can continue to allow smoking if their revenue from food does not exceed 25 percent of their combined food-alcohol revenue. 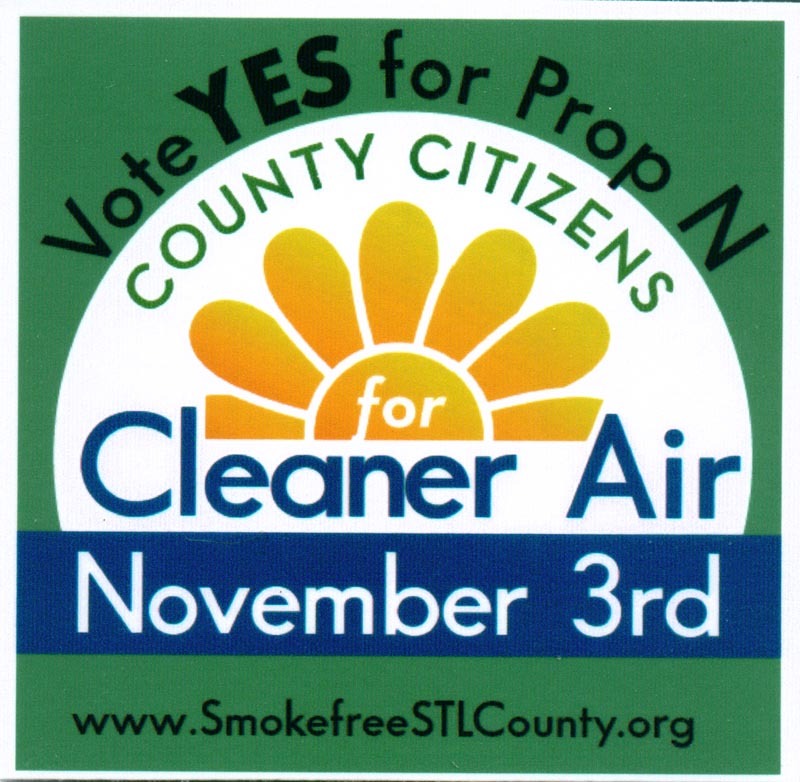 Mr. Chairman, I should first like to commend you on your efforts to extend smoke-free air to all public places and private workplaces in St. Louis County, St. Louis City and St. Charles County. This remains a worthy but elusive goal. A major reason casinos have been routinely exempted from regulation was their claim that failing to do so would result in a significant reduction in profit due to smokers fleeing to nearby smoking-permitted casinos, which in turn means a loss in tax revenue. That has, in fact, become a generally accepted mantra. When it became clear in 2007 that casinos in Illinois were likely to go smoke-free as a result of legislative efforts in that state I proposed a study by researchers I knew in the Center for Tobacco Policy Research (CTPR) in St. Louis. Dr. Douglas A. Luke, PhD, who leads that group, expressed interest in doing a major study to compare neighboring smoke-free casinos in Illinois with smoking-permitted casinos in Missouri, Iowa and Indiana, but a funding source could not be found. A multi-year study was eventually undertaken on a part-time basis by Dr. Jenine Harris, PhD, a biostatistician in the CTPR, after limited funding to cover some of her time was provided by Missouri GASP. She was assisted gratis by a number of her PhD colleagues who had expertise in different areas, such as Tim McBride, an economist. The result surprised me and was contrary to accepted wisdom. SOURCE: State gaming boards of Illinois, Indiana, Iowa and Missouri. THe only state that is reporting a drop in casino earnings is Illinois. That is the only one with a smoking ban. THey are down $800,000,000 in revenue to their State. Also, since you and the pro ban advocate from the City Council said that bans were good for business, why is the bar with the ban saying that their business is suffering? They should be packed. The smoking bars would be empty if the pro ban statements are true. mogasp comment: Sheila was asked to provide actual reference links for the “SOURCE” she notes above. That has not been supplied but I’m allowing this post. I think it would provide more confidence in her statement if this backup were provided. As for the $800 million, I believe that is over the period of years since the Illinois Smoke Free Air Act went into effect in January 2008, and approximately coincides with the start of the recession. Mr. Pion, your paper tries to blame the greater attendance losses of Illinois casinos on a more severely impacted Illinois economy. But your paper only concerns border casinos, those within a few miles of each other, which by definition share the same economy. Were the losses of the Casino Queen, located a few thousand feet from the nearest St. Louis casino, really better explained by the Illinois economy rather than a smoking ban? No, the smoking ban was the real difference. I should also point out that your paper only used two years of data and was primarily conducted by a biostatician with Wash U Center for Tobacco Policy, not exactly a nonpartisan group. mogasp reply: It makes perfect sense to only track casinos no more than 10 miles from the state borders in the respective states. Those are the ones you expected to be impacted by a statewide smoke-free air policy. The paper reviewed data for one year prior to the Illinois Smoke Free Air Act and one year following its implementation. That already took long enough and for a study with so little funding was quite an achievement, IMHO. I have confidence in the work of this group and expect it to stand up to legitimate academic scrutiny. Interesting that Barbara Fraser in tobacco control pointed out that there is no safe level of cooking fumes (50% increase in lung cancer) as opposed to the 30% increase normally associated with second hand smoke (SHS). Of course they had to cheat and use meta-analysis to get that 30% on SHS. It is also interesting that you would use a study by the Mellman group who until recently openly advertised that they would go to great lengths to achieve the poll results their handlers wanted. Of course you have to use the wayback machine to see it, but there is little reason to believe that this practice has stopped. from the wayback machine. mogasp response: If you check Barbara Fraser’s statement she said nothing like you assert: that cooking fumes cause a 50% increase in lung cancer. What she DID say was: “Food service workers have a 50% greater chance of dying from lung cancer than the general population,” attributed to the increased exposure to SHS. The attempt to undermine the legitimacy of the Mellman Group as a polling resource may or may not be valid. I’m unfamiliar with them, but I would hope they’d be a reliable outfit. Otherwise it’s a pointless exercise. 1) Mellman Group: I’m sure they’re quite reliable, but what they’re reliable for is producing the best possible results for their cients. I.E., if they fulfill their stated promise on their web pages, they will see to it that polls are structured, presented, and conducted in such a way as to give results as close as possible to “the outcomes” their clients want. 2) Coming directly off #1: It’s long been known that asking people about bans in public places in general will produce much higher poll numbers in favor of a ban than if the polled folks were specifically asked about banning it in bars. (No, I don’t have specific documentation handy on that, but I think if you examine your own honest memories of polls over the years that you’ll agree that I’m correct.) So to take the general question and then use those results for the specific instance of bars is deceptive. This puzzles me. If the results “surprised” you then that means you were expecting that the study would show that bans DID hurt casinos. So what exactly was the motivation for MOGASP to propose, fund, and conduct a study that it expected would give results AGAINST smoking bans, i.e. that they hurt casinos? Can you clear up my confusion? Was MOGASP for some reason hoping to produce a study that would encourage legislators to exempt casinos from the ban? If so, why? mogasp reply: I originally proposed the study to the Center for Tobacco Policy Research, headed by Dr. Doug Luke, which was then at St. Louis University but has since moved to Washington University St. Louis. When Dr. Luke was unable to find funding Dr. Jenine Harris agreed to do it part-time with limited funding provided by MoGASP. Prior to the results obtained by Dr. Harris everything I’d read locally about casino revenue and smoking was that revenues fell because of smoker desertion and evidently not being replaced by non-smokers. but I had seen no research to support this widely held view. That’s the reason for my expressing surprise. I didn’t know in advance how the research would turn out in this case, unlike other research in which I’ve been involved where I have a pretty good idea of what to expect, e.g. the claimed efficacy of smoking rooms in containing secondhand smoke, or of ceiling-mounted “smoke eaters” in doing the same. P.S. Your comment runs to over 1,600 characters but I’ll allow it as an exception to the rule. Casinos within ten miles of each other share the same local economy. How can statewide economic statistics be relevant? . mogasp comment: The original intent was for Dr. Harris to look at casino revenue vs. smoke-free air policy but it eventually became clear that that goal was unattainable due to the many variables involved. Hence the paper that was eventually published focused instead on attendance vs. smoking policy, which it was concluded could lead to reliable and still relevant conclusions. Thanks both for the quick/informative response and allowing the 1600! LOL! You’d been away so long I totally forgot the 1K thing! Gleep! One more question though: Given that your original question was about revenues then why did the study not look at revenues? Admissions are a valid statistic, and they might be expected, offhandedly, to correlate with revenues, but they are clearly not the same. E.G. If a casino bans smoking a non-smoking spouse might be more likely to just “tag-along” to watch a smoker gamble, or, if allowed, they might bring their teen kids to look around at all the lights and glitter. There would also be a tendency for non-smokers who’d previously stuck to one relatively non-smoky casino to go casino-hopping (particularly in the first year) or just stop in for the “shows” or gawking, and also a tendency for smokers thrown outside to wander over to the casino next door. With all of that interacting, choosing “admissions” seems odd: What motivated it? mogasp reply: That will likely be addressed in a detailed follow-up blog in progress. What has not been answered yet is why Marty Ginsberg first opposed the smoking ban and now is for removing exemptions. I think its as simple as his business has been hurt by the ban. He was against it because he felt that a ban would hurt his business. It seems he was correct. Now he feels that if the ban is furthered he might get some of his business back. This is a complete role reversal from prior comments that bans don’t hurt business. Apparently they do hurt business. Do people want smoke-free air? Yes and no are both correct answers. Most people that don’t smoke want to go to a restaurant and have smoke-free air. That is why over 70% of restaurants in St Louis County were smoke-free before the ban. They chose to do it on their own without government intervention. mogasp comment: Generally, one cannot make a blanket statement about any law in terms of its impact. Over time though smoke-free air will become the accepted norm. It’s already happened in some parts of metro St. Louis, e.g. in Ballwin. There is also the fact that all the attention is paid to how smokers will behave when a smoke-free air law goes into effect, ignoring how nonsmokers in general will react. Finally, this focus on the public ignores the impact on the health and welfare of nonsmoking employees (and even on smoking employees) which is the most significant good to result from this law. BTW, I don’t know where the 70% figure came from but is it relevant when talking about public health and welfare? If 70% of restaurants opted for clean drinking water in their establishments would that be acceptable from a public health standpoint? What is the impact? What is the increase in lung cancer? Heart disease? So what you are saying is that you don’t know the impact on business? You can’t say that the ban has hurt or helped Marty Ginsberg? The rough numbers from memory are 3,000 LCDs among non-smokers per year and at least 10 times that for heart disease. Marty Ginsburg, in his testimony, indicated that the absence of secondhand smoke was a definite plus to his health, as I understood it. He was complaining of losing business to competitors who had got an exemption from the law. I have no idea if that’s true or not. However, health-related laws are not generally subject to their impact on business or costs to society, unless they are clearly highly disproportionate. The cost of safe drinking water is not subject to debate, is it? MoGASP, actually that 3000 number came from the 1992 EPA report which was highly discredited. Not surprising that it was repeated in the 2006 SG report since the lead author Samet was one of the activist in scientific clothing who was part of the EPA report. As far as your comment on cooking fumes, It has been proven numerous times that cooking fumes are a greater risk to employees then ETS, again here is just one link.so her assertion that it is from ETS is patently false. and I continue to notice that practically all workers in the exempt establishments are themselves, smokers. So this claim that shs harms those workers is moot. and after 20 years of declines in shs exposure ( 70% decline by the year 2000), the LCD number should be coming down. Dave, maybe the LCD numbers HAVE gone down, and it’s just that nobody’s noticed? But what about ASTHMA #s? The 70% ETS exposure drop brought THOSE down, didn’t it? And don’t forget the WHO study with just one significant finding: 22% LESS LC among adults exposed to ETS as children. Or the new study (forget the author) showing a decrease in blood pressures among female children raised in smoking environments. Should parents be charged with child abuse if they DON’T smoke around their kids? I know recent reports are that LC among never-smokers in both USA and Canada are still increasing. LC is declining , however, overall, among former smokers. and the entire populations. Acttually, to be fair, I should clarify one point in my last post here. A few months ago there were headlines about a new study that supposedly showed blood pressures among young boys (6 years old? 8? I forget at the moment) were higher among those exposed to ETS. There were two things wrong with this. First of all the size of the increase was 1.6 points — a pretty meaningless increase even if it were real, and pretty obviously impossible to separate from confounders. Secondly, while the headlines and stories focused on the boys, the study had another set of findings: blood pressures among girls went *down* by 1.8 points: actually a bigger change than that for the boys and in the opposite, “healthy,” direction! Not only was this downplayed or ignored, one “authority” went so far as to say the 1.8 point decrease could be “alarming” ! Now picture if I did a study and found that an apple a day reduced kids’ blood pressures by 1.8 points. Do you think any authority out there would call that alarming and urge parents to keep those deadly apples away from their kids to protect them from hypertension? Let me clarify the blood pressure study. A few months ago there was a headlined new study supposedly warning of hypertensive blood pressure increases among 8-17 year old boys exposed to ETS. There were two things wrong with this. First of all the size of the increase was 1.6 points — a pretty meaningless increase even if real, and pretty obviously impossible to separate from confounders. Second, while the headlines and stories focused on the boys, the study had another finding: blood pressures among girls went *down* by 1.8 points: actually a bigger change than that for the boys and in the opposite, “healthy,” direction! Not only was this downplayed or ignored, one “authority” claimed the 1.8 point decrease could be “alarming”! Now if I did a study and showing an apple a day reduced kids’ blood pressures by 1.8 points, do you think any authority out there would call that alarming and urge parents to keep those deadly apples away from their kids to protect them from hypotension?